We will publish our last avalanche forecast for the 2018/2019 season on Sunday April 21st. Thank you to all who have supported the avalanche center through volunteer hours, field observations, and financial support. This avalanche advisory is provided through a partnership between the Tahoe National Forest and the Sierra Avalanche Center. This advisory covers the Central Sierra Nevada Mountains between Yuba Pass on the north and Ebbetts Pass on the south. Click here for a map of the forecast area. This advisory applies only to backcountry areas outside established ski area boundaries. This advisory describes general avalanche conditions and local variations always occur. This advisory expires 24 hours after the posted time unless otherwise noted. The information in this advisory is provided by the USDA Forest Service who is solely responsible for its content. Both above and below treeline widespread MODERATE avalanche danger will quickly form today on all aspects on slopes 35 degrees and steeper in response to daytime warming. Temperatures have remained above freezing across most of the forecast area since Sunday morning. A high pressure ridge over the central Sierra should keep these warmer temperatures going today and tomorrow. Today's weather looks very similar to yesterday's and tomorrow's with daytime highs in the upper 40's and low 50's accompanied by moderate southwest winds. Overnight lows should only dip into the 30's. Mostly sunny skies this morning should give way to mostly cloudy skies this afternoon through tomorrow due to a low pressure moving through the Pacific Northwest. A weak overnight refreeze gave way to heavy wet snow on all aspects by mid-morning yesterday. Widespread wet roller balls and pinwheels occurred on Red Lake Peak, Ralston Peak, and in areas along the Sierra Crest between Mt. Lincoln and Shirley Canyon. By early afternoon on Tinker's Knob and above Shirley Canyon these wet snow instabilities would grow up to 3 ft in diameter before breaking apart (photo). Ski cuts on steep sun-exposed test slopes caused some wet loose snow sluffs along with the large roller balls in these areas (video). Snowpit data on Red Lake and near Anderson Peak both showed free water in the upper portion of the snowpack even on NE aspects. This water had not percolated down to the old persistent weak layer in either area. Tests on the PWL on Red Lake Peak still indicated that it could become reactive again if the snow above it weakens enough (video). Mostly clear skies should have allowed some refreezing to occur last night even though temperatures remained above freezing in almost all areas. Warm temperatures and morning sunshine should quickly melt this thin refreeze and allow allow the layer of wet snow that already exists from the last two days of above freezing temperatures to become deeper. This melting will cause widespread wet snow instabilities to form again today. These instabilities could exist on all aspects at all elevations due to the fact that the sun will even reach onto the north facing slopes and clouds will help distribute the warmth across all aspects this afternoon. Roller balls, wet loose snow avalanches, and wet slab avalanches will all remain possible today. Areas with more of the recent storm snow remaining will hold the best potential for larger wet snow instabilities and wet slab avalanches. Surface instabilities like roller balls and pinwheels and simple observations like stepping off one's skis, board, or snowmobile and sinking up to boot-top depth in wet snow can indicate potential instability on a slope. Use these clues to help determine when to move to a different slope or when to head down and have that afternoon BBQ. Due to the depth of the persistent weak layer (5 to 8 ft down) and the strength of the snow above it, triggering a deep slab avalanche on NW-N-NE aspects has become unlikely. At this time data indicates that collapsing this layer would require an extremely large trigger or significant weakening of the snowpack. Spring melting could eventually allow cause enough snowpack weakening a deep wet slab avalanche cycle to occur. Even though data indicates that this has not happened yet, conditions that could create this scenario keep getting closer as more and more melting occurs each day and free water percolates farther into the snowpack. 0600 temperature: 30-36 deg. F.
Max. temperature in the last 24 hours: 38-48 deg. F.
Temperatures: 48-54 deg. F. 27-34 deg. F. 48-54 deg. F.
Expected snowfall: O in. O in. O in. Temperatures: 40-50 deg. F. 28-36 deg. F. 40-50 deg. 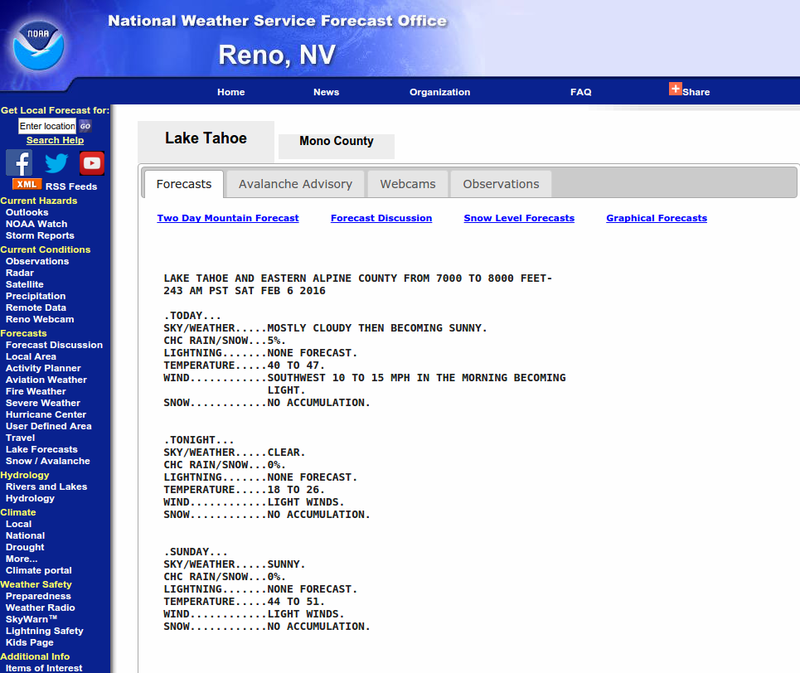 F.
This website is owned and maintained by the non-profit arm of the Sierra Avalanche Center. Some of the content is updated by the USDA avalanche forecasters including the forecasts and some observational data. The USDA is not responsible for any advertising, fund-raising events/information, or sponsorship information, or other content not related to the forecasts and the data pertaining to the forecasts.